Mangaluru, August 12, 2018: At a meet with the media on August 11, Saturday, SCDCC Bank Chairman M N Rajendra Kumar said the bank has done a turnover of Rs 6748.84 crore. The targeted business turnover for 2018-19 is Rs 7700 crore. The South Canara District Central Cooperative (SCDCC) Bank has registered a profit of Rs 28.63 crore as on March 31, 2018, the highest ever so far in the history of the bank. The bank had posted a profit of Rs 24.07 crore last year. He said the robust loan payment has helped the bank to post the profit. The bank has collected a deposit of Rs 3561.24 crore in its 105 branches in 2017-18. It has lent Rs 1,199.48 crore loan to the agriculture sector and has achieved 100% recovery of farm loan for the 23 consecutive years, he said. Rajendra Kumar said 84,000 RuPay cards have been given to the farmers already. The RuPay debit cards have been given to 43,621 customers. To a question on loan waiver announced by the state government, he said that the SCDCC Bank is likely to get Rs 724 crore in the form of loan waiver from the government. In the loan waiver announced by the previous government, the SCDCC Bank has already received Rs 183 crore and a sum of Rs 193 crore is yet to be received from the government, he said. 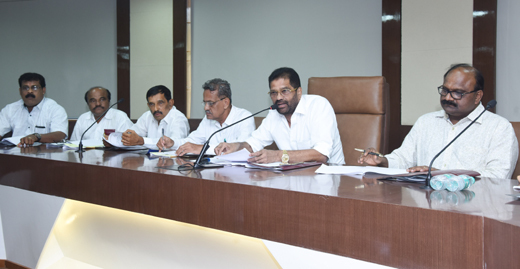 The SCDCC Bank is mulling over implementing common software for all the agriculture credit cooperative societies in Dakshina Kannada and Udupi districts. Rajendra Kumar said the common software helps in introducing uniform accounting system. Though the state government and Nabard have been promising to introduce common software for the last few years, it is not implemented so far, he stated. He said the SCDCC Bank is also planning to introduce Tab banking, wherein a bank account can be opened by sitting at home or office using the bank’s Tablet. In addition, it has proposed to introduce mobile banking to the customers. Through mobile banking, the customers can transfer money from one account to another. It will also help the customer in getting a mini statement and updating the passbook, he said and added that the internet banking services will be introduced shortly. With the help of National Payment Corporation of India (NPCI), the SCDCC Bank is mulling over an interbank mobile payment system it was informed.